The semiconductor industry depends upon a broad range of instrumental techniques in order to detect and analyze impurities that may be present in specialty and electronic gases, including permanent gases, water vapor, reaction by-products, and metal species. 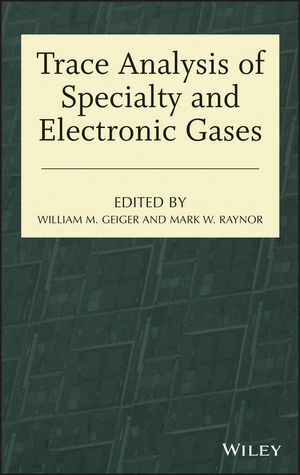 Trace Analysis of Specialty and Electronic Gases draws together all the latest advances in analytical chemistry, providing researchers with both the theory and the operating principles of the full spectrum of instrumental techniques available for specialty and electronic gas analysis. Moreover, the book details the advantages and disadvantages of each technique, steering readers away from common pitfalls. Lastly, the book examines gas mixtures and standards that are critical for instrument calibration. There are also two appendices offering information on fittings and material compatibility. With its thorough review of the literature and step-by-step guidance, Trace Analysis of Specialty and Electronic Gases enables researchers to take full advantage of the latest advances in gas analysis. Although the book's focus is the semiconductor and electronics industry, analytical chemists in other industries facing challenges with such issues as detection selectivity and sensitivity, matrix gas interference, and materials compatibility will also discover plenty of useful analytical approaches and techniques. WILLIAM M. GEIGER, B.S., is Senior Partner of CONSCI, LTD, an independent service provider. He is responsible for implementation of analytical technology as it relates to gas analysis, including method development, turn-key instrumentation for customers, and consultation. Mr. Geiger has authored or coauthored numerous papers and presentations relating to trace gas measurement techniques. MARK W. RAYNOR, PhD, is Senior R&D Director at Matheson's Advanced Technology Center. He is responsible for the development of new gas products and precursors for the electronics industry, with an emphasis on the development of instrumental techniques for gas analysis as well as the synthesis, scale-up and purification of specialty gases. Dr Raynor has authored or coauthored more than sixty papers in analytical chemistry.